The Club of Rome launched its Climate Emergency Plan, a bold and urgent call to action for all stakeholders in the climate challenge. 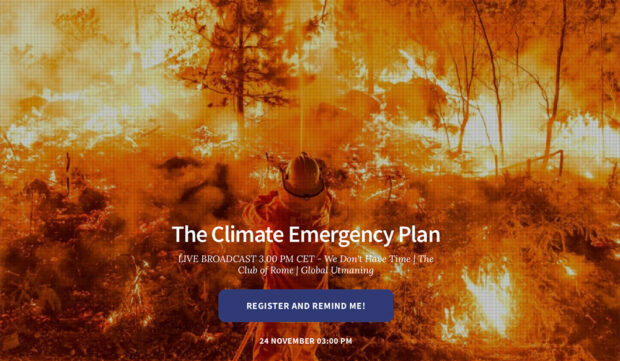 The Plan was presented to the public for the first time during a live global broadcast of a Climate seminar on Saturday, November 24th jointly organised with We Don’t Have Time and Global Utmaning. The Club will then host a formal launch event on 4th December at the European Parliament, attended by MEPs, European Commission officials, NGOs and businesses. To put the situation into historical perspective, the Club of Rome alerted the world to the environmental and demographic challenges ahead as long as fifty years ago. The central message of The Limits to Growth – A Report to the Club of Rome published in 1972, was that the quest for unlimited growth in population, material goods and resources, on a finite planet, would eventually result in the collapse of its economic and environmental systems. Unfortunately, it seems this prediction is beginning to materialize and will escalate, unless humanity radically changes course. Together with the mass extinction of species and the rise of inequality within and between nations, climate change is human society’s most pressing global challenge. Until recently, it was seen as a future threat; but today, increasing climate chaos is a reality affecting the lives of millions. In the 21st Century, it will dictate the long-term prosperity and security of nations and of the entire planet, more than any other issue. With this emergency paper, the Club of Rome is attempting to respond to the direct calls for action from citizens around the world, and to formulate a plan that will meet suitably ambitious reduction targets and ensure climate stability. The Climate Emergency Plan can be downloaded here. Hey Buddy!, I found this information for you: "The Club of Rome launched Climate Emergency Plan". Here is the website link: https://www.duurzaam-ondernemen.nl/the-club-of-rome-launched-climate-emergency-plan/. Thank you.